Track and field ace Ellie O’Hara started her second year at U17 level with some record-breaking performances at Scottish Athletics U17 Championships in Glasgow last weekend. While other Borders athletes were also delivering high-grade displays in their own disciplines, Ellie, of Cardrona, turned her attention to the indoor season, where she already held the Scottish record in triple jump. She had also broken the Scottish outdoor record four times in last year’s open-air season. After a series of fine early season leaps in the triple jump, Ellie took gold with a new championship and Scottish record of 12 metres 11cm, the second longest jump in the UK all-time rankings for her age group. The Peebles High School pupil, coached by Linda Nicholson, then focused on the long jump, where she faced the UK number one, Abigail Pawlett. Although Abigail was the top seed, Ellie again produced a fine series of jumps, leading from the first round and jumping 5 metres 89cm in the third round to take gold with a new Championship and Scottish record. 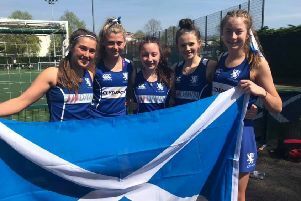 Ellie (16), part of Scottish Athletics Development Academy and Live Borders Athlete Support Programme, also reached the final of the 60 metres, having run the heat and semi-final between the triple jump and long jump, where she finished fourth. Although out of the medals, she ran a great new personal best time, so she was happy with the day’s results, having broken two Scottish records in two different events within a couple of hours. Ellie now moves on to the Under 20 Championships, stepping up an age group, and she will hope to emulate last season’s U20 indoor championships, where she took gold in triple jump with what was then a new Scottish record.